This wall is a reproduction of the cover dvd of the film "usual suspects" (I precise for the one or two people who didn't notice :D ). So he is deliberately simple. Don't hesitate to give your opinion or advices, they're welcoming. Yup, one of these was done a few months ago for the female cast. Not too bad at all for being one of your first walls! Great job, love the concept! i like it too. they are all my favorite so there is no one on it i dont like! As previously pointed out by the other comments, it's a good idea. That the background feels very... dead. It's a gradient with text on it. 1024x768 is a pretty low resolution. This isn't a very big deal, but I thought I should at least mention it. I wouldn't use a wallpaper with that low resolution as they tend to look wierd when i stretch them on my 1600x1200 desktop. All in all, considering the time you say you have used on it and previous experience, good job. Quote by brynjarAs previously pointed out by the other comments, it's a good idea. Link to 1600x1200 resolution available now. nice wall .... T______T....i like it ! even it look simple .... but it still COOL! Cool youneo j'aime bien l'idee ^^ c'est original. This certainly made me laugh. One little problem, though - most names you have Japanese-style, but Ishida and Sado (those are their family names) are named Western-style. Quote by dianekikiulaThis certainly made me laugh. 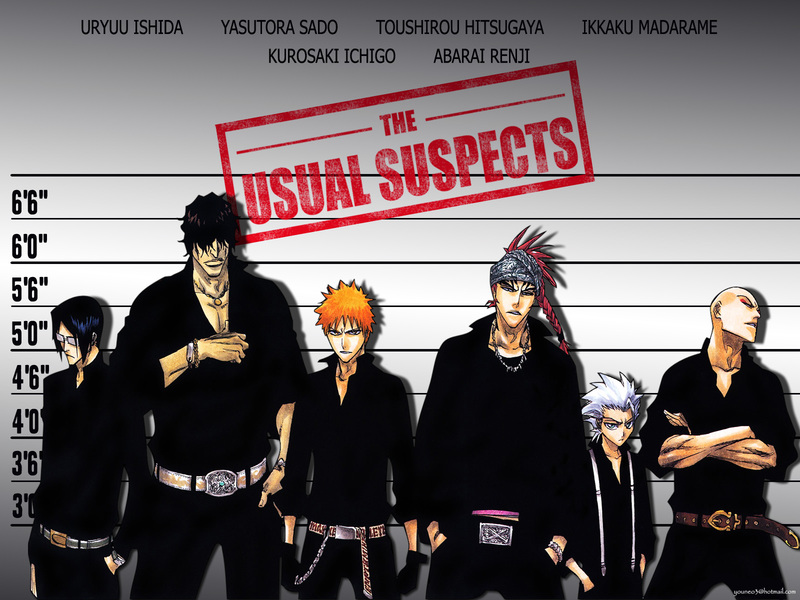 yay ... a wallpaper with the shinigami in normal clothes. Sado & Ichida in black look great, too. :) Nice wallpaper. Keep it up! Well, the wallpaper looks great, and I congratulate you. For a n00b, you've done pretty well XP (just kidding there, congratulations).